Answer: No matter your MBTI type, depression is always a highly emotional experience, so that ought to clear up the myth that T-types can’t be depressed. Function-wise, depression tends to lock people into their introverted functions (this applies more to clinical depression than acute depression). As an ENFP, you’re likely going to lock yourself into your Fi and Si functions. Depending on the intensity of your depression, as well a your ability to control it (here, the word control is subjective), you may also end up suppressing your extroverted functions entirely. All types manifest their introverted functions through an extroverted function. You, as an ENFP manifest your Fi through your NeTe. This means that the moment you start suppressing your extroverted functions, you disconnect yourself from the rest of the world. For my Fe readers wondering about depression, your difficulties will be different. Fe users have the advantage of easily going to friends and verbally venting their feelings (after which they will feel a lot better). This makes them prime candidates for counselling, whereas Fi users will be more reluctant to enter counselling. On the downside, Fe users aren’t quite as good at understanding and putting a name to their emotions. They may end up not noticing that they’re depressed at all, and end up taking out their feelings on other people, so be aware of that. Fi users have the disadvantage of not being able to vent to other people. For this reason, I do think that Fi depression is more intense, lonely and difficult to cope with than Fe depression. My advice to you is to make sure you’re using your extroverted functions to let your feelings out, rather than continually internalising your emotions. Use your Ne creativity to vent, be it through art, music, writing etc. Oh, and look up Neil Gaiman’s commencement speech right now. I found that very helpful. I’m an INTJ and am only just coming to terms with it in my 50’s. I was told throughout my early life that I was over-sensitive and needy and perceived myself as a person who ran very much on her ‘feelings’, now I realise why. Every psychometric instrument I’ve ever been assessed with tells me ‘Thinker’ ‘Analyst’ and because I accepted the criticisms of others, I failed to accurately perceive my traits; independence of thought, extreme introversion, lack of desire to be like others, failure to fit in. I too, lack the alleged brutality of the conventional INTJ stereotype, which has made it difficult to see this clearly. Since my 30’s, I’ve lived alone (except for my daughter until she grew up) and find that I’m probably the happiest I’ve ever been. Reflecting on the previous posts, I realise that the only times that I have been ‘needy’ and ‘over-sensitive’ is when I have been in extremis. I’ve had some fairly scary health issues since childhood and during periods of crises, I have tended to be needy and over-emotional, reaching out to others in a way that I never normally would if I was in my generally self-contained, ‘ one-foot-in-front-of-the-other’, zone. I struggle even more when I become aware of it and hate myself for it! Thank you for these insightful comments. Thank you for this article. I realize it is over a year old by two days, but I discovered it in the middle of a somewhat deep depression. I am a musician, songwriter, etc, and have been stuck in the mode of over-analyzing everything and getting sucked into a spiral of feeling more and more hopeless. This was huge for me. I wrote a song to get all the junk out of my head and externalized, and I feel tremendously liberated as a result. So again, thank you for your insights. I’m going to try and deliberately externalize the jumbled up ball of emotions, to avoid these bouts with depression in the future. Thank you thank you thank you. Be blessed. Thank you , kind sir, for this website. I just stumbled upon it while researching some helpful ways to deal with some specific issues in regards to my INTJ (possibly IXTJ) roommate and dear friend, and was lead here. Allow me to briefly introduce myself (because I am sure I will be exchanging pleasantries much more with you and others on here) so that I am not just another anonymous blank thumbnail. My name is Dustin and I am a 25 year old ENFP living in the state of Tennessee in the US. I have been into the MBTI for about 2 years now and whole-heartedly believe it as Gospel, despite some friends calling me insane for thinking it has real merit (my INTJ roommate in question being the biggest skeptic). I digress though. Enough about me. In regards to this post in particular, thank you (again) for writing. I sadly have not studied the cognitive functions to the degree I wish to or need to, so reading about how they are affected in depression is always intriguing to me. I really only have two things to say about the post itself. The first is that you are spot-on in describing how my type deals with depression. I have in the past (and in the last few weeks as well) dealt with depression and the dark side of life and can attest to all of these points as fact. I am not great at hiding these things because the change in an ENFP from our regular operations is extremely noticeable when we are held captive by thoughts and feelings. The thing I would add for others to understand is, as I have told my best friend (also an INTJ) before, whereas the world views certain types as being consistently level-headed and cool (or emotionless), they seem to view ENFPs as always and forever happy and peppy. This is a fallacy. ENFPs may default to extreme highs, but in the occasions that we bottom out, our lows stretch to the River Styx. ENFPs can understand people well because we can feel the whole gamut of human emotions (and I jokingly say we even feel new ones others never have). I once read an article that said ENFPs consistently test as the only type to not be at risk for any mental illness. Obviously this is a blanket statement, but I still was caught off guard by it. I again jokingly, but only half so, told my friend that the reason we don’t test for any is that we are capable of developing all, but because our nature is to care for others and the expense of ourselves (and because of societal pressures to always be the happy encouraging idealist) we have developed strong and surefire measures of burying these things deep when we have to do so. I also think this is why many ENFPs who are secure in themselves and have a mature development of their own functions and an understanding of others’ become good friends with INTJs and why several times I have read that the bonds between an ENFP and INTJ consistently measure as the strongest between any two types: because we feel this tension within us of always being optimistic and viewing the world for what it is in the way an INTJ does. This can also lead to us having a deeply sarcastic and dark sense of humor, the likes of which (in my experience) INTJs seem most appreciative of among all the types. I digress again though. Maybe all of that is just myself. I’d like to think I can speak for most ENFPs, but I also know I am different than a good deal of those of my type because my life has been marred by some dark things. Either way, be aware that when eternally happy types get depressed, it may not last long, but it is a deep and dark hole into which they have fallen. The second thing is brief, just a question about the end of the post. You said you the biggest correlation between types and depression seems to be NPs. Is that just experience or can you reference some articles or studies for me? I’d love to read further into this is you can direct me to such places. Thanks (for the third time) for this site. I appreciate others that get the MBTI, and I am especially grateful for INTJs (if only because most of my closest friends are that). Nice to meet you, though I’m not sure I would call myself kind. That note about NPs at the end of my article was just based on my own personal experience. All right I see, so two kinds of expressions (for the ponytail that seems a little bit weird). Thank’s for your answer. Doesn’t matter for the type, I think I was in the case of a despress recently what’s why typing myself seems a little bit hard and why I try to learn more about this. I have hoped to say something who could betray myself (like when some peoples are so “enthusiastic” that they show their process. I try to be natural and develop but well… I understand without datas it’s almost impossible). Well, thank’s again and I will return learn my english. What do you think is the difference (if they have) between the depression where you seem to use only yours introverts functions and the shadows functions who are the complete opposite of your type ? I meen, you (and others of course) say shadows functions are express by a stress or disease, so technically, depression could make appear the shadows functions and not only suppress the extraverts functions. Isn’t ? So, in your opinion, where is the subtlety between both ? Do you think shadows functions could be the way to communicate with others when ordinary functions are disturbed like in the case of depress or depression and expression of the shadows are really two differents things ? I’d need more information about you specifically to tell you your type. I think a couple of things may have been lost in translation, but I’ve done my utmost to interpret your question. To answer your question, I’ll use ENFPs again. 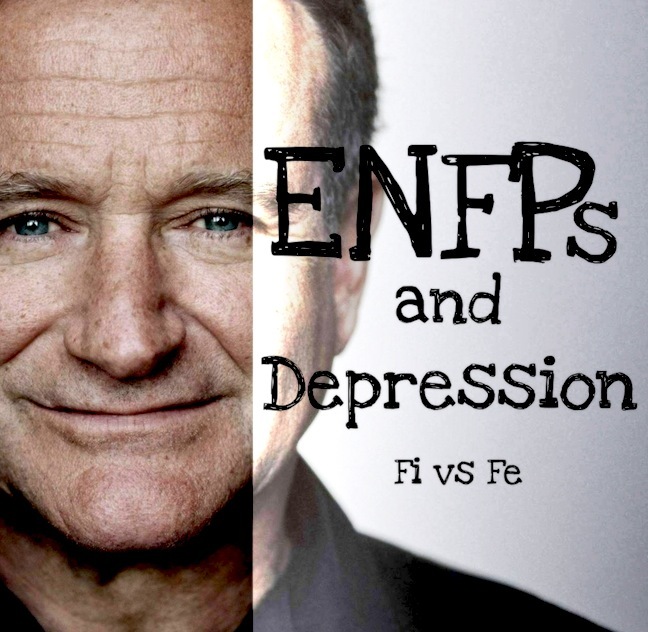 A depressed ENFP who’s locked into their shadow functions is likely going to lose hope in the future (Ni), become critical about group expectations and start to rebel against and disengage from group activities and people (Fe). They will come to believe in ideas that are illogical and contradictory (Ti), and may seek ridiculously large amounts of physical stimulation (or do absolutely nothing with their time) (Se). They’re going to be more sarcastic and less ENFP like than ENFPs who aren’t locked into their shadow functions. A depressed ENFP who uses only their introverted functions is going to be incredibly disorganised and unmotivated to take charge of their life (missing Te). Their feelings will overwhelm them and they will be unable to rationally consider alternative realities (missing Te). They will not make needed connections between ideas (for instance, they may not connect the dots between horses and why a woman’s ponytail is called a ponytail) and will stop believing in their dreams (missing Ne). A heavy focus on the past is further likely in such ENFPs, coupled with an inability to connect to the future/present without considering past pain (missing Ne). Oft times, you’ll see one person go through both types of depression over a course of time. I can relate to this so much, especially the 2nd type described in your comment. I’m not sure if I’m suffering from depression, however I sense that something is off in my life. As an INFP, I’m comfortable with introversion, however I’m not using my full potentials. I couldn’t quite put my finger on what’s wrong until now. So, thank you very much.